A CNC retrofitted Machine Tool can often be as effective as a new Machine Tool for a fraction of the price. The retrofit can introduce such things as high spindle speeds, contouring with multi axis interpolation and can allow the re-engineering of a machine tool resulting in new methods of machining. Benefits can be the increase of available production time, the reduction of out of tolerance product and the opportunity of contracts previously out of reach. 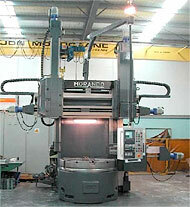 Since inception, Acumat has enjoyed a very close partnership with CNC Design Pty. Ltd.
• Operator training on new control systems, machine operation and function. Right are before and after photographs of one of three Morando VS 14 Vertical Borers reconditioned and CNC Retrofit by Acumat and CNC Design for Smorgon Steel Manufacturing. 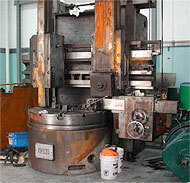 All three machines prior to the retrofit were hydraulic /electric copy turning machines. We fully reconditioned these machines and converted all axes to ballscrew drive and six channel CNC control, enabling each head to contour machine a different path to the other two heads.